Bandera City Hall is located at 511 Main Street, Bandera, TX 78003; phone: 830-796-3765. Photo: B.F. Langford Jr. and Mary Hay House, ca. 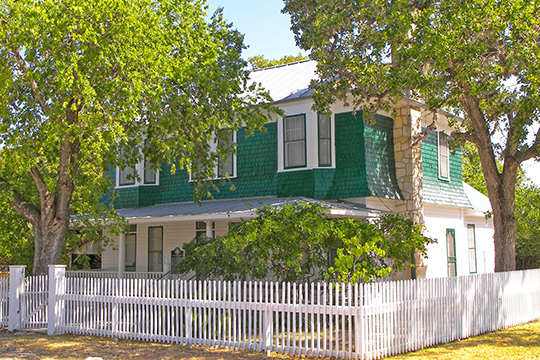 1922, 415 Fourteenth Street, Bandera, TX. Listed on the National Register of Historic Places in 2005, Photographed by User:Larry D. Moore (own work), 2009, [cc-by-3.0 (creativecommons.org/licenses/by/3.0)], via Wikimedia Commons, accessed April, 2016. Bandera  is a city of charm and character. The bounty of the land and the meandering Medina River with its cypress-lined banks attracted the first Native Americans, the Spaniards, Tejanos and in the 1850s the first Anglo, European and Polish settlers. Historic buildings such as the old courthouse and jail, the Convention and Visitors Center Building (formerly the Hay house), St. Stanislaus Church, the Frontier Times Museum, and the new County Courthouse still stand. In the late 1860s, the area became known as a gathering point for cattle drives. Bandera became a supply point for many of the cattle drives, including the Western Trail drive, thus establishing Bandera's legacy as a western town. The presence of dude ranches since the 1920s made Bandera a tourist destination and in 1948 was designated the Cowboy Capital of the World. Having seven National and World Cowboy Champions gives further credence to this title. Entertaining ranch guests led to Bandera developing its music and dance venues, its rodeos, town shops and restaurants. Unlike many Texas towns, the population of Bandera has always been an eclectic diverse group of people with a vibrant mix of ethnicities. This uniqueness fosters individuals with strong independent beliefs but also individuals who live the western way of life and who will put differences aside and unite when a crisis occurs. Historic floods, droughts, economic difficulties, military wars and the respect given veterans are all factors that have contributed to Bandera's colorful legacy. City of Bandera Master Plan, 2009, www.cityofbandera.org, accessed April, 2016.